I really enjoyed this book – I loved the movie as a kid and it was really interesting to see the differences and similarities between them. I did feel though, that the characters weren’t as well developed as they could have been, and I would have preferred the plot to have been a bit meatier. It is one of those books that I really wanted to adore because its a classic, but I have to say, in comparison to some books of that era that I’ve read, it just doesn’t compete. 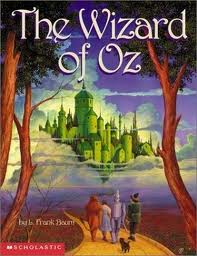 That been said I have only read the first of the Oz series, and I am definitely open to reading more and I didn’t dislike it, I just wasn’t head over heels for it. 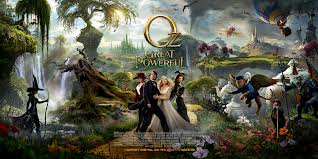 The first thing about Oz that is it is visually stunning. Every single shot is just droll worthy and although I am not normally a fan of 3D I have to admit it was used really well and not at all gimmicky – I also loved the nods to the original film. However, this isn’t a poor man’s Wizard of Oz rip off. Oscar, the main character, is as flawed and sometimes unlikable character as they come. I loved this – it made a distinction between the original. Oscar develops so much as a character throughout the film. I really loved James Franco’s portrayal of Oscar – he really made him come to life in a really believable way. After journeying into Oz, the first witch Oscar comes across is Theodora, a very naïve young woman who is desperate for peace in Oz. Theodora also seriously changes throughout the movie – although I would have loved to see a more gradual change rather then BAM. I think it would have been more true to her original character to see her struggle a bit more. I liked Mila Kunis’s portrayal of Theodora – but I wish she put a bit more into the change in her. Evanora, Theodora’s sister was probably my least favourite character – there was nothing to her – no layers, nothing – I really disliked her. I loved Glinda – she differed to the original and was a bit more feisty. The plot was pretty average – there were a couple of twists and turns, but I never felt that Oscar wasn’t going to win – I also felt that there was no retribution for his earlier actions. However, I really LOVED watching this film – it was entertaining and fun and beautiful and I will be getting the DVD. I definitely recommend it. Angelas Anxious Life also has a great review up! Glad you liked it as well! I did think it was a gorgeous film!